Q. People are never going to give up their love affair with the automobile. So why would they change? Q. Do I have to share the vehicle with strangers? A. No, the vehicle is yours during the duration of the trip. Car pooling is still possible, but voluntary. Q. What if I throw a party and ten PRT vehicles all show up at my residence at the same time? A. To begin with, the situation is somewhat implausible. People do not show up at the same time, even when the event is scheduled for a specific time. But to more directly answer the question, one vehicle would unload passengers at the off ramp closest to your residence. The second vehicle would stop at the next closest off ramp. And so on. Passengers not immediately adjacent to your residence would have the option of waiting for a closer spot to open up, in which the vehicle would move to the closer spot for offloading. Or the passengers could simply exit where they are and walk the remaining distance. With the automobile, guest end up parking progressively further down the block as well, so the situation is not that different. Destinations with heavy traffic (grocery stores, malls, etc) would have many off ramps near the entrances to facilitate the increased volume of visitors. Q. Can someone purchase a vehicle for dedicated use? A. Difficult to predict. I would guess that the cost would be too great to justify in most cases. Would the President have a dedicated vehicle? Most likely, due to security concerns and such. But if ownership was permitted based solely on monetary grounds, two obvious problems arise. First, it works against one advantage of the PRT system: fewer overall PRT vehicles are needed than automobiles. Secondly, given the rigid design and maintenance constraints of the PRT, even if private ownership was allowed, vehicle servicing would still be restricted to designated service centers based on safety grounds. Clearly private individuals could not be allowed to modify the primary mechanical aspects of the PRT vehicles. Q. How long would I need to wait for a vehicle? A. That depends. To summon a vehicle from home might take several minutes. Of course if the central routing system observes that you request a vehicle every day at 5:15, the system would "learn" and anticipate your need, sending a vehicle in your direction. If you're just leaving the grocery store, you probably wouldn't have any wait as this sort of location would typically have one or two vehicles already standing by, similar to how taxis line up at the airport. To assist in anticipating vehicle demand, the very act of passing through the grocery checkout line would alert the central routing system of a possible vehicle need. There are many ways to add intelligence to the routing process. Finally, wait times would clearly depend on the total number of PRT vehicles in the system. Q. How would I keep my 6-year old from getting on a PRT vehicle and visiting his friends without my knowledge? A. PRT vehicles require biometric identification prior to accepting a routing requests. It would be at the discretion of parents to dictate what level of control their children would have. The child might only be allowed to initiate routing to school or a grandparents home. The child might only be allowed to travel during certain times. The parent could designate that a text message be sent requesting confirmation of any travel. Clearly the options for controlling routing are endless. One could restrict the travel of elderly parents as well. Ultimately the PRT would provide a great convenience to society, giving mobility to individuals who do not currently have that option. Q. What prevents someone from holding a vehicle needlessly by placing a object in the doorway? A. The PRT should probably not simply be free, but rather managed as a pay-as-you-go system. As with a taxicab, even just waiting for passengers would register on the "meter". This approach would provide the easiest mechanism for managing such issues. While carpooling would not be required, the concept is still valid for managing the PRT in situations where large numbers of people are all traveling to similar destinations. Q. What if someone tampers with a vehicle, causing a breakdown in communications with the central routing system? A. To begin with, all vehicles are monitored by onboard video surveillance cameras at all times, acting as a deterrent to such behavior. Secondly, the very moment that the central routing system loses contact with the vehicle, it is assumed to be out of control and remotely activated "stop points" on the adjacent tracks would be activated. 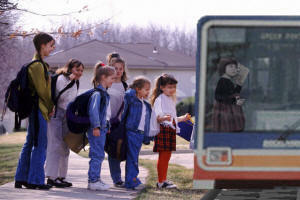 Don't forget...any nearby PRT vehicle also has surveillance cameras which could be employed to analyze the situation. Finally, a maintenance vehicle would be dispatched to the scene, capable of towing the target to the closest service center. Q. What about privacy concerns? Wouldn't the PRT allow the government to track my every move? A. The potential for privacy abuse cannot be denied. This is a problem inherent with technology at many levels and ultimately must be addressed by intelligent legislation. The automobile is no exception...watch this. Q. It might work for urban areas, but not for rural areas. The cost would be too great for all those miles of sparsely populated roads. A. That true. Any mass transportation idea fails in this scenario. So it's likely that rural areas would continue to use the automobile for some time to come. Either they would be converted last or not at all. But the PRT system still makes sense for the urban areas and is not incompatible. Visitors from the country would park their vehicle at the edge of town and ride the PRT to their final destination. Q. What happens to all the unused automobiles once the PRT system is implemented? A. The PRT system would take years to construct. Existing automobiles would naturally migrate to the unincorporated areas of the system as they are resold as used vehicles. So while the new automobile market would certainly be impacted, the existing automobiles would not be wasted.